Getting a job in a distant country is a dream for many working people. The excitement that comes with shifting from one city to an entirely different setting with a unique culture can be very mesmerizing. However, working in a foreign country has its share of demands and intrigues. For instance operating in Australia can be very exciting for those who have never been to Australia. This is despite the existing requirements to work in Australia. Still, there is a federal minimum wage payable in Australia which by 2004 stood at $467.40 per week. Contrary to this, not all job sectors can afford to pay this level of salary to their employees. For instance, in 2004, the mean weekly wage for adults engaged in full-time employment was an estimated $960 for men and $698 for women. These figures were inclusive of overtime for both genders. About a third of the total number of employees earns less than $450 a week. This minority group is dominantly comprised of migrants from countries that do not speak English. Only 10% of the employees earn more than $1200 a week. Graduates who move to Australia can expect to earn annual salaries of around $36000. Managing directors make around $350000 to $600000 a year in Sydney compared to $200000 to $400000 in Melbourne and $140000 TO $225000 in Perth. The working hours in Australia vary from employer to employer. The position and the industry one is employed also determine the working hours. In 1981, a national 38-hour working week was introduced. This was a requirement to work in Australia for all those who were employed. Nevertheless, it has since been reduced to 37 hours. Other employees work for longer hours such as those contracted in factories who clock at least ten hours or more in overtime weekly. A standard working day for a blue-collar worker is usually from 7 or 8 am to 3.30 or 4.30 pm. Average office hours run from 8.30 or 9.30am to around 4.30 or 5.30 pm. 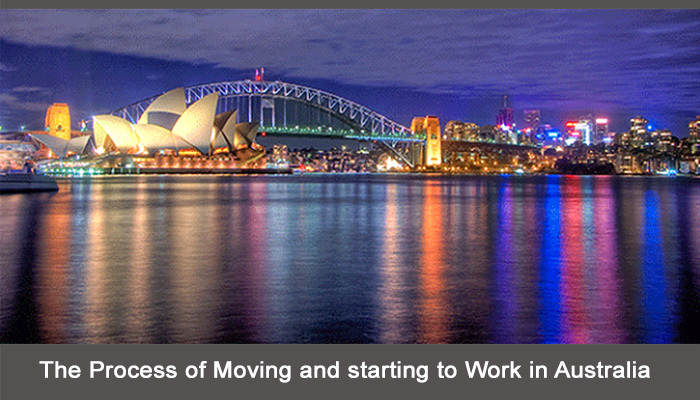 As a requirement to work in Australia, one needs to have a tax file number. This number consists of nine digits and is crucial in determining the amount of taxes paid by workers. If a worker does not have one, the maximum rate of taxes (47%) applies to all wages earned. A tax file number allows an employee to claim unemployment and sickness benefits and invest in any business. Next Next post: How Can I Learn The Language of My Country? My dream is I want to go to Australia for higher education and jobs. But I don’t know about process of apply to visa please help me how can i apply for visa…? And thanks for this given valuable information. It’s provided always valuable information….thanks you. Hello morevisas, My brother want to go to Australia for study so can you please tell me what is the process of apply for visa and how many days will take…? Nice update…your team always given valuable information..thank you. I am very happy and satisfied with MoreVisas consultancy. It’s provided grate service by all team members.thanks you for given me Australia visa. Morevisas given always important information..thank you morevisas. My brother want to go to Australia so please help him. please tell me what is the process of apply to visa? ?